The traditional exhaustive preparation that goes into making a typical Umbrian prosciutto begins with salting the fresh prosciutto: for two weeks the ham is covered periodically with a mixture of salt, garlic, pepper, and white wine. After the prosciutto receives a bath of the wine, it remains in this manner for two or three months while it absorbs the flavors of all the previously placed ingredients. Following a period of three months left in this state, a final bath in wine is given, and then comes the delicate phase of applying a plaster-like covering of garlic and pepper to protect it from airborne elements and to keep the part of the prosciutto that is in contact with the air from becoming too hard. At this point it is left to stay for another three months. The entire process takes twelve months. That is why Umbrian prosciutto is so good! 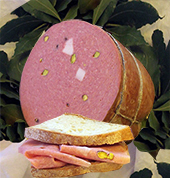 handicraft mortadella, no food allergens, few fat, of unique taste, it distinguishes him for the quality of the used meats and for the end workmanship. Ideal among two slices of cooked bread to firewood or also cut thick heated to the oven. Great promotion meats wild, all to 29,80 to the kg. Flavoured meats of swine with natural aromas, salt pepper and shattered wild fennel or in seeds. Of rosy colour with little presence of fat, characteristic, this last, that gently confers to the product a balanced taste that differentiates it from other similar products in commerce. This specialty from the particularly amazing taste is produced with meat of swine and venison of deer with salt, pepper, little garlic and a mixture selected of spice it is seasoned for 30/45 days. Its particular sweet taste finds the ideal combining with white wines slightly moved and with cheese seeds seasoned to soft pasta. 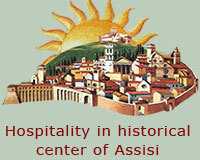 It is the precious specialty of the salamis of Assisi. di mulo" g. 300 ca. 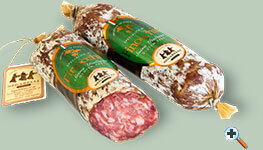 Also this salami is produced by the middle grinding of meat of pork of Italy. The characteristic is in the presence, in the heart of the salami, of a die of “ lard “, with spices that confers to this specialty a particularly sweet taste. Bagged in natural gut it purchases the particular form from which it derives the dialect name. It is a specialty typical of our hilly zones., from the definite taste and from the intense and persistent perfume. Its definite taste is appreciated in particular way in combining with a mature cheese, bread cooked to firewood and red wine. Meat of Italian pork a little fat they are used for producing this particular excellent salami to enrich and to complete a good appetizer of meats. Your spicy taste decidedly the combining makes almost obligatory with some very soft fresh and fresh cheeses accompanied by a white slightly moved. 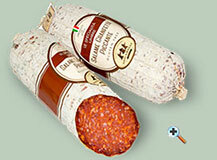 Pure pork salami, soft typically, seasoned with fennel. 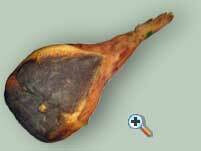 Typical umbrian pork cold meat (ham from the neck), aged for over 90 days, tender and flavoured. Pure pork salami, slightly smoked, seasoned with chili pepper and paprika. 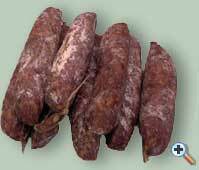 Typical small aged salamis, of pure pork. Ideal for antipasti, starters, snacks, picnics. 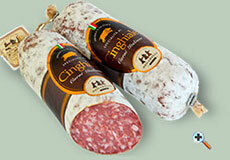 Classic umbrian salami of pure pork, seasoned with black ground pepper, and garlic flavour. Aged a year, seasoned with pepper, garlic, wine. It it also available boned, cleaned and packed in small quantity. 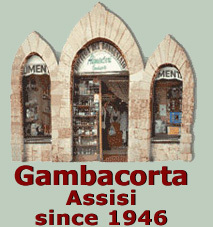 The traditional typical ham of the Umbria, seasoned more than one year, flavored pepper, garlic, wine, are available boned, vacuum-packed in small quantity. Prepared with different parts of pig meat - pulp of shoulder, loin, ham, bacon - spicy with aromas and spice: salt, ground black pepper, wine and crushed garlic, the Ciauscolo can be tasted as classical salami or spread on bread's slices slightly toasted. Adds in small doses in you mix of meat (lasagnas, full, meatballs, etc.) it strengthens the taste of it. 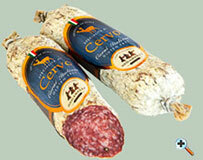 Classical salami of Umbria of pure swine, spicy to the whole pepper, with light taste of garlic, seasoned. 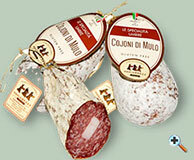 it is the salami of the snacks and the rustic appetizers with carciofini, dry tomatoes, bruschette. 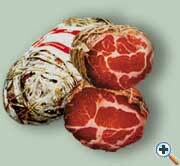 To enjoy the wonderful aromas and flavors of seasoned ham we offer two convenient 250 gram packages sold together. Thinly sliced and vacuum-packed at the moment of ordering for utmost freshness. Suggested accompaniments include pane sciapo (traditional Umbrian ‘plain’ bread) lightly toasted and a touch of mostarda di anguria bianca (mustard of white watermelon). To enjoy the wonderful aromas and flavors of speck we offer two convenient 250 gram packages sold together. Thinly sliced and vacuum-packed at the moment of ordering for utmost freshness. Suggested accompaniments include pane sciapo (traditional Umbrian "plain" bread) lightly toasted and a touch of mostarda di anguria bianca (mustard of white watermelon). To taste an assortment of traditional salami of Umbria we can send two wrappings of 250 g. each with: corallina, capocollo, finocchiona, hot-spicy salame, Thinly sliced and vacuum-packed at the moment of ordering for utmost freshness. 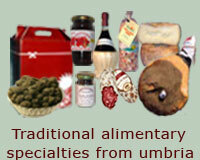 Suggested accompaniments include pane sciapo (traditional Umbrian "plain" bread) lightly toasted. Spicy with aromas and spice, destined to the most impassioned gourmets. To the full taste, savory of the salami, the meat of buck adds a wilder, intense and strong taste. Seasoned one year, tasty, been fragrant of pepper, wine as the typical ham but slightly smoked with smokes of firewood, boned, in pieces manufactured in vacuum. No fat, of salty delicate taste not. Very savory and tasty meat, spicy to the outside with wild fennel, it has the characteristic to absolutely be produced with cuts of no fat meat. Of average seasoning, soft, not salty, the assortment of meats makes in an appetizer or in a snack of meats and cheeses richer and original. 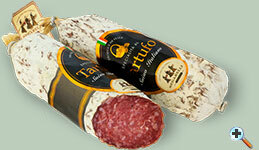 Prepared using a meticulous balance of wild boar and pork, enhanced by natural spices and sliced black truffles. Ideal as an appetizer paired with porcini mushrooms in olive oil, as an accompaniment to fresh vegetables or even for picnic sandwiches! It is a salami of pig with a characteristic form, grinded thin, enriched with a small seasoned lard and spicy place to the center of the salami, that it confers a particular taste. Small strips of loin of swine seasoned with salt, pepper, fennel and coriander, are hung to "couple" in front of the fire to make to dry you and slightly smoked to preserve for many months. The "Coppiette" they consume cut to small die together to other meats, to the bread and red wine. Questo prodotto è una rara specialità. Sulle colline umbre vengono allevati suini allo stato brado fino all'età di oltre due anni e a un peso di 200/250 kg. Le carni ottenute dalla macellazione vengono trattate secondo tradizione e lasciate maturare a lungo all'aria, dopo averle lavate con vino e condite con aglio e pepe. Il prosciutto è stagionato dai due ai tre anni. E' molto saporoso ma non salato, grasso e magro, morbido nonostante la lunga stagionatura. Del prosciutto "Brado" se ne può ordinare 500 grammi, finemente affettato a mano, confezionato, al momento dell'ordine, sotto vuoto in due vaschette da 250 g. ciascuna. Come il prosciutto "Brado" anche il capocollo viene prodotto con carne di suino allevato all'aperto. Il capocollo è condito con sale, pepe, finocchio ed un leggero profumo di aglio, è stagionato un anno, saporoso ma non salato, morbido e magro. Del capocollo "Brado" se ne può ordinare 500 grammi affettato, confezionato al momento della spedizione, sotto vuoto in due vaschette da 250 g. ciascuna. La pancetta ha le caratteristiche degli altri salumi di carne di suini allevati all'aperto, è ben stagionata e molto saporosa. Affettata sottile è la migliore farcitura per due fette appena tostate di pane sciapo cotto a legna. E' unica per la condire gli strangozzi alla matriciana o alla carbonara. Piccoli salamini stagionati, morbidi, dolci, magri. Prodotti con la carne dei suini allevati allo stato brado si distinguono per il sapore che ricorda i salami di una volta prodotti in casa quando c'era la tradizione di macellare il suino per uso privato.